At Arecont Vision®, we believe in providing the most optimal camera solution to meet the customized video surveillance requirements of our customers. We realize that every scene, situation, challenge, and environment is unique. Therefore, the SituationalPlus™approach by Arecont Vision makes it easy to pinpoint the right Arecont Vision camera to fit your needs. 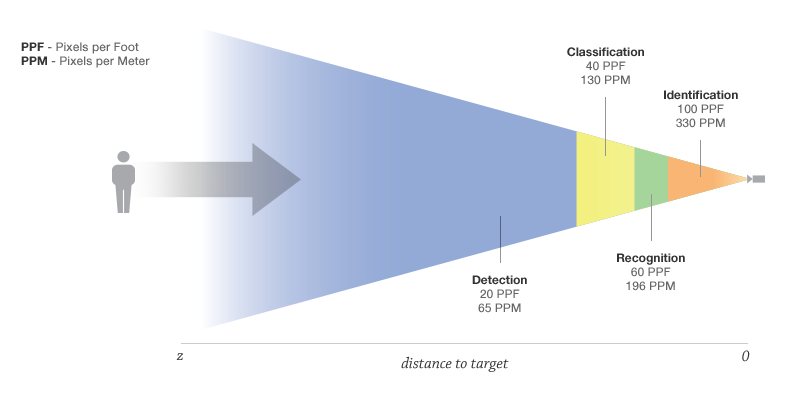 SituationalPlus is the sweet spot of 60PPF (60 pixels per foot) / 196PPM (196 pixels per meter) where a camera’s resolution and chosen optics provide sufficient resolution for identifying details. Calculating for SituationalPlus™ ensures the camera you choose features the Right Resolution, with the Right Optics, and the Right Illumination for your specific scene. Situational Awareness, a term originated by the military referring to a pilot’s operational status and knowledge of immediate threats, has been broadened in its use to security applications. For video surveillance, Situational Awareness is the overall understanding of actions occurring in a given scene or a person’s surroundings. 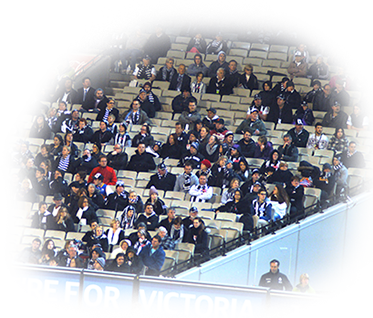 Arecont Vision offers camera solutions to cover large and crowded areas with enough detail to help pinpoint perpetrators and threats. The right video surveillance system increases a security operator's ability to identify the early signs of danger so that any potential act of violence may be prevented or mitigated. 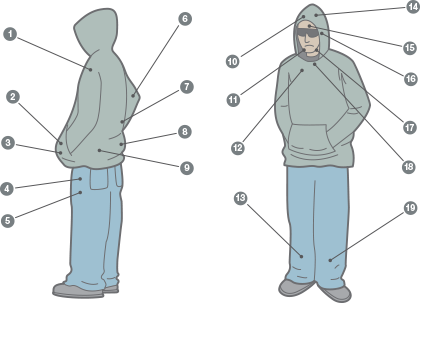 The right amount of detail from a video surveillance system can help investigators examine pre- or post-attack indicators such as oversized clothing, concealed hands, or abnormal body language. Click on the number indicators to the right for more information. Arecont Vision® megapixel technology delivers superior image quality and reduces overall system costs by covering large areas with fewer cameras. With the widest variety of resolution options available, Arecont Vision makes it simple to achieve detailed images at a low cost of pixels per foot. Deploying the right optics enables capturing important details for excellent unique scene. Many Arecont Vision all-in-one cameras come standard with optic packages that are acceptably accurate for most installation scenarios. However, the completely customizable Arecont Vision MegaVideo® Series IP cameras, as well as SurroundVideo® Omni and MicroDome® Series all-in-one IP camera solutions, have multiple lenses to choose from for more unique installations. Choosing the Best Lens Option – Determining the correct focal range for a scene is just as important as selecting a camera with the right resolution. Ensuring a scene has the proper amount of illumination is another key component required when using the SituationalPlus design model. To ensure a camera captures optimal details in dark or night-time environments, high performance LED infrared illuminators or visible white light illuminators may be required in order to reduce noise for better compression, reduced bit rate, and to optimize bandwidth. Choosing a camera that provides the right features for the scene is critical when designing a video surveillance system. Arecont Vision cameras are designed and manufactured in the USA with features to meet the requirements of each scene. For example, wide dynamic range is available as an option for applications that are exposed to direct sunlight or glare. The principle of DCRI (Detection, Classification, Recognition, and Identification) compares viewing distance against visual comprehension and clarity of a scene. DCRI was originally developed by John Johnson of the United States Army night vision lab to help define the required image quality for military-related surveillance applications. DCRI is very helpful, especially with powerful megapixel and multi-sensor megapixel IP cameras that vary significantly in pixel density, performance, and application. The ability to determine that there is an object within the camera’s field of view. The ability to determine if the “subject" is a human or an animal. The ability to determine primary features such as the clothes a person is wearing. The ability to identify specific details of a person’s face or alphanumeric numbering on a license plate. SituationalPlus™ takes the DCRI concept and simplifies it into three parts. 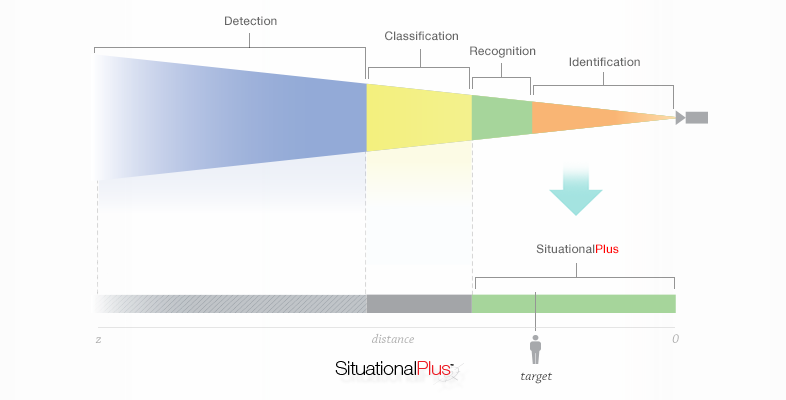 These are Detection, Classification, and “SituationalPlus”, which is a combination of Recognition and Identification. SituationalPlus is the area of coverage in a scene you wish the camera to capture fully with distinguishable details. 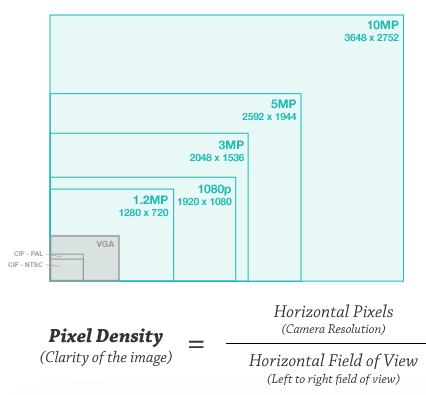 Specifically, this area is at a pixel density of 60PPF or higher. Detection and Classification are now secondary and represent areas that are not critical for detailed coverage but still visible and relevant within a scene. SituationalPlus™ is represented in green, while “Classification” and “Detection” are represented in shades of gray. The shades of gray are not indicating a lack of coverage, but rather a drop in forensic detail from what is expected with SituationalPlus. The example below demonstrates this fall-off of SituationalPlus from the viewpoint of the camera. Refer to the help section of the SituationalPlus™ calculator for more information. 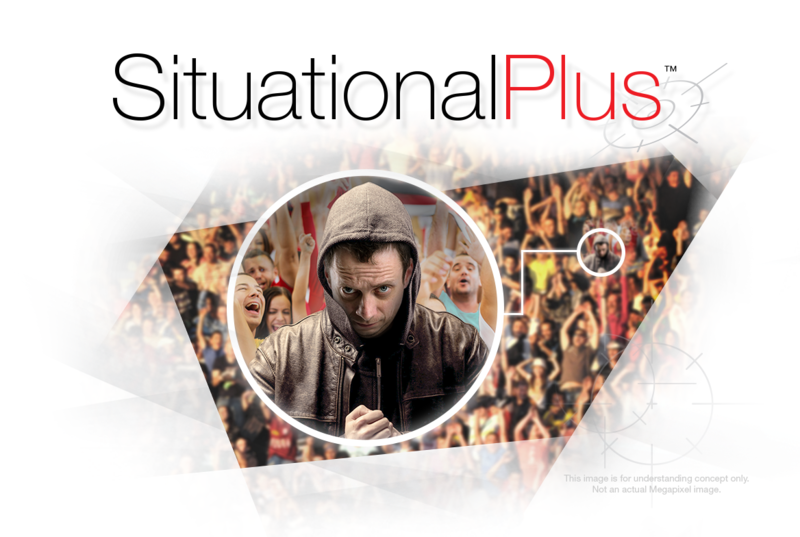 The SituationalPlus calculator provides users with a customized approach for finding the right camera for their individual scene. Insert your requirements for the scene and then drill down to find the camera that meets your needs.